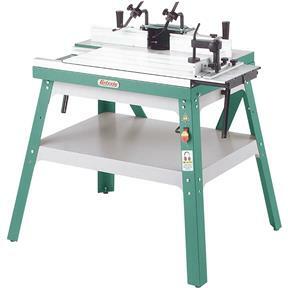 If you’ve already invested in a big router and lots of router bits, but want the benefits of a solid stationary shaper, then this Sliding Table Router Table is for you. 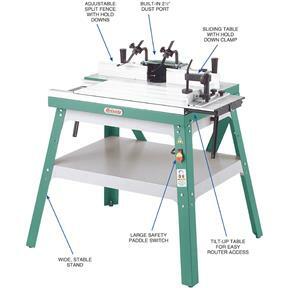 The sliding table makes material processing much easier and safer, particularly when making raised panels or shaping short sides. 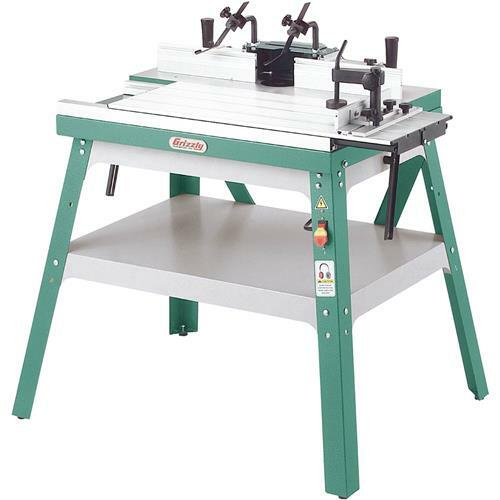 The split fence is easy to adjust and provides full support along both sides of the workpiece. 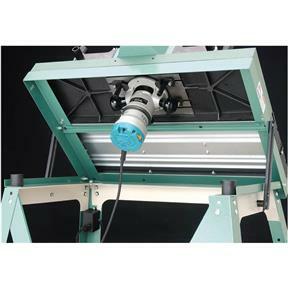 Other features include a 2-1/2" dust hood, tilt-up table for easy router access, universal router mount and sturdy stand with a convenient shelf. 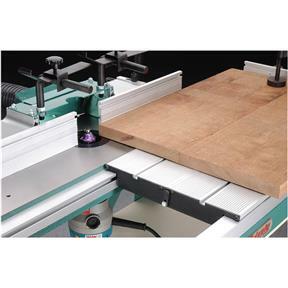 Last but not least, a large safety paddle switch in the frame allows you to turn the router ON/OFF without bending over and reaching under the table. Very convenient! Main table surface: 31" x 10"
Sliding table surface: 31" x 12"
Table insert diameters ID: 1-1/8" and 2-5/16"
Fence size (x2): 3" x 12"
Approximate shipping weight: 132 lbs. Needed to build a frame to raise the table 4 inches to make it level with my table saw. It would be nice if the legs were adjustable in height. The table shipping was poor. The box was labeled hande with care. The box had no corners left on it from the shipping. It looked like it had been dropped several times. There was one piece that had been bent. I was able to straighten it out during the assembly process, The table works great and I would recommend it to anyone. We just received the Router Table today and got it put together and made a few cuts. From what I can tell it will do what we want it to. We bought it to make cabinet doors so the slide is going to make the job so much easier. I will say that mounting the router is a little difficult. I wish the machine came with six mounts rather than the four, I will likely add extras. So am I happy with the sliding table, Yes I am. 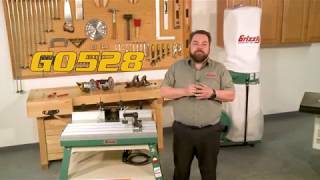 great router table that is sliding type. I bought this about 3 weeks ago and I love the sliding table. I am 100 percent disabled and I still like tinkering in the wood shop. Good table, with two exceptions. The below table mounting system for the router is very difficult to secure the router. Additionally, the two arms that hold the table up to work under the table are nearly useless. This is a serious injury looking for a place to happen. The screws that are intended to hold this heavy work table up are way under sized. I love this table. I bought it for a couple of projects that I had in mind. i could not have known just how valuable it would be. My only suggestion for improvement is the support structure that supports the table when it is lifted. Given how heavy duty this table is, the supports don't seem to match. I ended up making modifications to make it work more smoothly. Other than that, it has done everything that I have asked of it. Difficult to raise and lock table. Sharp edge to deal with. Method of securing router base to top needs improving. Overall well built. I had to modify legs I order to add casters that lock. Top is thick cast steel. Aluminum slide did not align with steel top. I had to add shims underneath. I bought this table three months ago and I am very happy with the quality. The only thing I would like is to be able to add a router lift.